Today's strain of the day is #sweetkush. A heady hybrid bred from #sweettooth and #Ogkush which provides powerful cerebral effects as well as a relaxing body high. I will say off the rip I did not think I was going to LOVE this strain. The taste was a bit floral and lacking the lemon punch I expected considering its extreme lemon terps in the flower. Taste soon became irrelevant though as I found myself laughing hysterically at everything. A true "blissful" high great for getting out of a funk. A few hits of this and depression symptoms fadded, my body felt great and I felt very creative. Super useful strain for so many symptoms #pain #depression #anxiety#appetite and so much more.
. 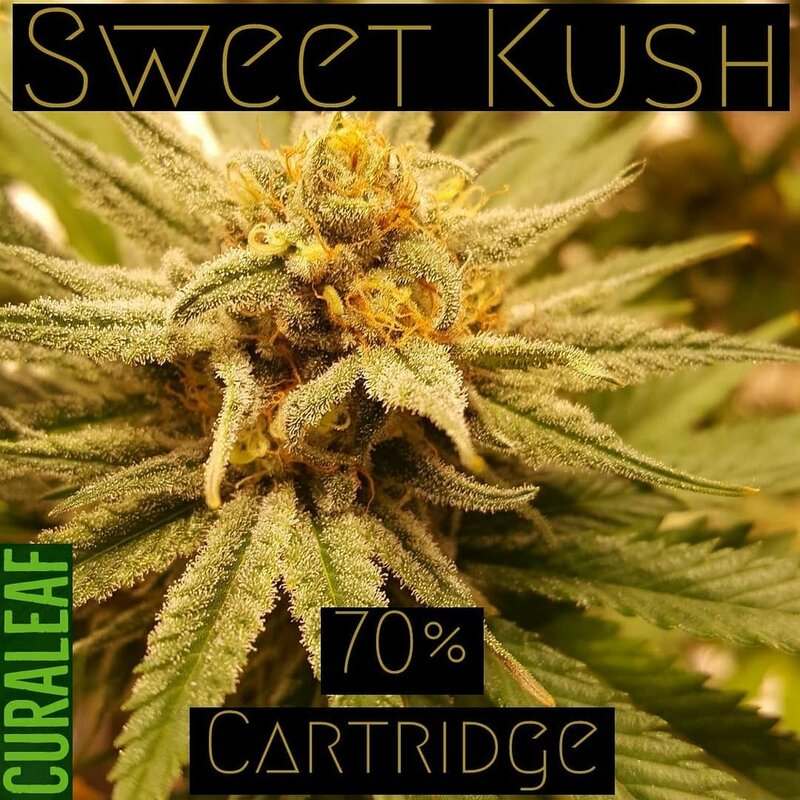 If you haven't tried the sweet kush from @curaleaf_inc. You are missing out! . Happy #terpenetuesday, I picked this up last year and am just now doing the review, sorry for the wait ;) I've had #citradelicsunset from alt med. In shatter form and absolutely loved it! When I saw they had the same strain in a cannabis terpene infused disposable I HAD TO TRY IT! Crazy, full cannabis smell and taste in a convenient, breath activated throw away pen. These pens are perfect for on the go and situations where discretion is preferred. Every hit from this citradelic sunset disposable pen feels and taste like a mini dab of the shatter. So smooth! No food grade terpenes, REAL strain specific cannabis terpens. Ive said it before but I'll say it again... this makes a WORLD of difference in taste, smell and effect. A sweet "tangerine peel" citrus-like taste lingers with each puff. The effects are heavily sativa dominate but not lacking the healing qualities of its split indica lineage. Uplifting and extreamly cerebral, you can expect sharp focus, creativity and a general sense of happiness. Citradelic Sunset is a perfect Daytime strain for getting some chores done , getting out of a funk, or just kicking back and laughing at some standup comedy. .
"When people tell me "You're going to regret that in the morning", I sleep in until noon because I'm a problem solver." Good morning #slayers and happy #shatterday. Today's review is on one of my favorite MüV Gold strains in a all in one, convenient, throw away disposable vape pen. A spicy citrus terpene profile can be found with full heavy hits every time from this breath activated "portable dab stick". Every puff on this cannabis terpene infused "all-in-one" vape pen hits like a small dab from a rig! Super potent, full flavor and none of the mess. I love taking these disposables to the @tampabaylightning.insta games, movie theaters and theme parks, or anywhere when smoking traditionally isn't an option. This #pillowfactory is a perfect indica for anyone dealing with chronic pain of all kinds. Fibromyalgia, arthritis back pain, insomnia, anxiety and so many other ailments can be relieved with this Black Fire x Mandarin Sunset cross. Cost efficient, super Terpy, potent and discreet. Hands down my favorite disposables in the state . @muv.fl keep up the great work! .